The signal moment in the budget reform agenda of Gov. Rick Snyder came by a margin of one, as the state Senate voted 20-19 in May 2011 to approve a $1.7 billion tax cut for business and impose a variety of changes to Michigan’s personal income tax. Lt. Gov. Brian Calley cast a rare tie-breaking vote to push the legislation across the finish line. While controversial even today, the measure was one factor – an improving economy being another – that ended years of budget turmoil in the State Capitol. And it all would have been dead on arrival under a proposed constitutional amendment -- Proposal 5 -- that would require a two-thirds vote of the Legislature to enact new taxes. “It's crazy. It's the silliest thing I have ever seen,” said Mitch Bean* of Great Lakes Economic Consulting. Bean is a former director of the House Fiscal Agency, the nonpartisan analysis staff of the state House. Long-time Lansing political observer Bill Ballenger said it's hard to predict what the short-term impact would be should Proposal 5 pass. “The politicians themselves -- the governor and the legislators -- don't have a clue what they might do if this passes,” said Ballenger, editor of Inside Michigan Politics. Bean doubts that other significant tax reform measures -- including Michigan's income tax or 1994's Proposal A revamping how Michigan schools are funded -- would have happened under terms of Proposal 5. But beyond that, Bean shares the concern raised by state budget director John Nixon that approval of the amendment could jeopardize Michigan's bond rating – which affects how much the state has to pay to borrow money. “One of the things that rating companies look at is your ability to pay. This significantly reduces your ability to pay,” Bean said. Prop 5 earns a thumbs-down from the Michigan Chamber of Commerce, which considers it poorly drafted and a threat to responsible tax reform. Tricia Kinley, the chamber's senior director of tax and regulatory reform, stressed that the chamber, by no means, views tax increases as the first solution to government challenges. The measure is pushed by Michigan Alliance for Prosperity, which raised $1.9 million to put it on the ballot. Most of that money came from Liberty Bell Agency Inc., which lists the same Sterling Heights address as a trucking firm controlled by Manuel “Matty” Moroun, billionaire owner of the Ambassador Bridge. Former Michigan Republican Party Chairman Saul Anuzis supports Prop 5, while disputing the assertion it would prevent legislators from doing their job. He maintains it puts sensible restrictions on their ability to extract more money from taxpayers. In its analysis issued in September, the nonpartisan Citizens Research Council of Michigan concluded the measure could hamper the Legislature's ability to deal with complex fiscal issues. It echoed Bean's concern over its impact on the state's bond rating. “Supermajority vote requirements make it more difficult to respond to financial challenges that might call for additional tax revenues ...Temporary tax increases occasionally are needed to avoid program cutbacks and eliminations when state economies (and tax revenues) are adversely affected by recession. For these reasons, adoption of a two-thirds vote requirement for tax increases could affect Michigan’s bond rating, which in turn could affect the state’s cost of borrowing,” it stated. CRC's Eric Lupher, co-author of the report, said he understands the sentiment of frustrated taxpayers who might be attracted to limits on the power to tax. Michigan, in fact, already has a major tax limitation system in the constitution. Commonly known as the “Headlee Amendment,” the system was enacted by voters in 1978 and includes a prohibition on state taxation in a given year that generates revenue beyond a certain amount established by formula. As detailed in a House Fiscal Agency analysis, Michigan hasn’t been near the Headlee revenue cap since 2000. The long-term trend shows state tax collections moving consistently away from the maximum allowed by Headlee. In March 1993, Michigan attracted unwanted national attention when the Kalkaska Public Schools closed three months early because it was out of money. The shutdown was symptomatic of a broken system for funding public education that was heavily dependent on local property taxes and riven by substantial per-pupil spending gaps between rich and poor districts. A few months later, legislators approved a series of measures to put Proposal A on the ballot in 1994, a major shift in how schools were funded that included a property tax cut, an increase in the sales tax from 4 cents to 6 cents, a cut in the income tax from 4.6 percent to 4.4 percent and a 50-cent boost in the tax on a pack of cigarettes. It closed the gap in spending between districts. Voters approved it 61 percent to 39 percent. Many of the votes sending the package of bills forward fell short of the two-thirds margin Proposal 5 requires. And the political compromises it took to assemble the elements of Proposal A “would have been much more difficult” under terms of the proposed amendment, Lupher believes. By the mid-1990s, Michigan's local roads and highways routinely ranked among the worst in the nation as state gas tax revenues failed to keep pace with maintenance and new construction costs. In 1997, thanks to considerable arm-twisting by Gov. John Engler, the Legislature voted to raise the tax from 15 cents to 19 cents a gallon. The margin was 20-16 in the state Senate, well short of the two-thirds margin Proposal 5 would mandate. Michigan's roads are still crumbling, though, rated second worst in the nation in 2010 by Overdrive Magazine. In 2010, a national transportation research group estimated that Detroit's deteriorating roads cost drivers $536 a year. But revenue remains short of need because of increased automobile efficiency and the fact that many consumers cut back on driving because of higher gas prices. Gov. Rick Snyder has proposed increasing Michigan's Transportation Fund by at least $1 billion a year and has advocated replacing the gasoline tax with a wholesale tax on fuel and an increase in registration fees. While legislation to do so remains stalled in Lansing, prospects for any such measure would seem even more remote should Proposal 5 pass. “Here we have roads that are clearly in bad shape to anyone who drives on them,” said Lupher of the Citizens Research Council. “We know that it adds to the cost of locating here, whether you are business or an individual. It costs more to repair your automobile. It's easy to say we don't want more taxes. But do we want to forego the services paid for with taxes? *Editor’s note: Mitch Bean is a member of the Bridge Board of Advisers. 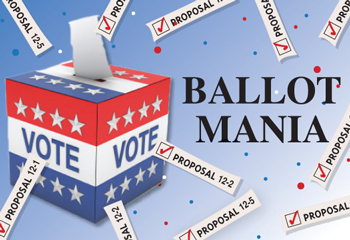 WHAT VOTERS WILL DECIDE: If you vote for Proposal 5, it is effectively a vote to give a minority of the Legislature the power over tax changes. If you vote against Proposal 5, effectively you are supporting the status quo on tax policy, as governed by the Headlee Amendment. WHAT THE ADS SAY: Proponents of Proposal 5 have kept their powder dry on the ad front, but have used Twitter to argue that Proposal 5 will require consensus on tax matters and will taxpayers from “unnecessary tax increases. Opponents of Proposal 5 have used mailers to argue it leaves decisions on taxes to only 13 members of the 148-member Legislature and it would make it more difficult to ensure delivery of public services. WHAT THE TRUTH SQUAD SAYS: The Michigan Truth Squad has not weighed in on Proposal 5, as both sides have chosen to wait to launch major advertising campaigns.